While Trek reference books vary in their usefulness and interest, for sheer entertainment value nothing beats Phil Farrand's nitpicker's guides. Most anybody who watches Trek will have sat up at least once and said "hang on a minute, that makes no sense!" Most of us shake our heads and carry on watching. Phil didn't go that way - he turned it into a near obsession instead. The man has an amazingly good eye for detail. Virtually any time anything happens that's not quite as sensible as it should be, you can be sure that he will pick it up. 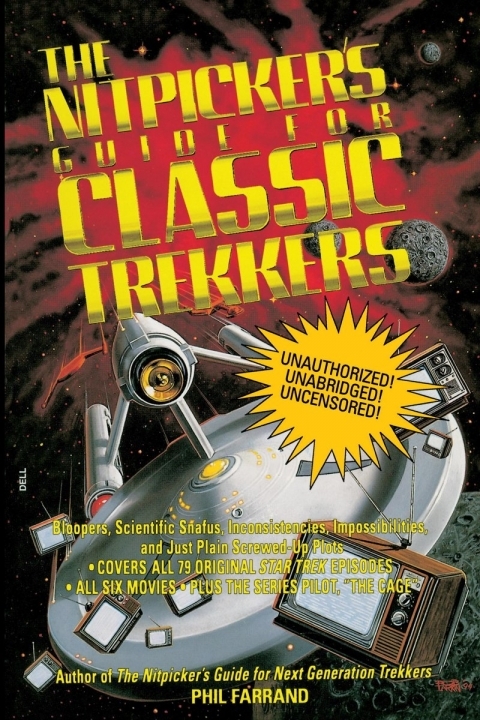 The book gives a basic plot description for each episode, then lists the nits in various categories; moments when a boom mike wandered into shot or the classic "the glass is empty one moment and full the next", plot holes, occasions when the name of a planet is wrong, you name it and it's here. He also lists the stills used in the closing titles, which were different each episode, and asks you some trivia questions. Now and again you disagree with the nits Phil picks, and every once in a while you spot something he missed. On at least a couple of occasions I spotted nits in the nitpicker's guide! But all that just adds to the fun of it, making these books a positive joy to read.